This custard tart recipe is, quite possibly, one of the most joyful desserts ever invented. The subtle hint of thyme sits beautifully beside the tangy fruit. A winner. Make the pastry. Beat the butter and sugar together until fluffy, then gradually beat in the egg yolks. Add the flour and salt and mix until you can form a dough. Knead briefly, shape into a ball, wrap in cling film and chill for at least 10 minutes. Preheat the oven to 200°C/fan180°C/gas 6. On a lightly floured surface, roll out the pastry to the thickness of a 50p coin and use to line a deep (3cm), 23cm fluted tart tin. Prick the base all over with a fork and line with baking paper. Fill with baking beans or rice. Place on a baking sheet and blind-bake in the oven for 10 minutes. Remove the beans/rice and paper and return to the oven for a further 5 minutes until the pastry is lightly golden and crisp. Whisk the eggs, egg yolks, sugar, vanilla seeds and cornflour together in a bowl. In a clean pan, heat the cream with 3 of the thyme sprigs until almost boiling, then pour over the egg mixture. Stir to make a custard. Reduce the oven temperature to 180°C/fan160°C/gas 4. 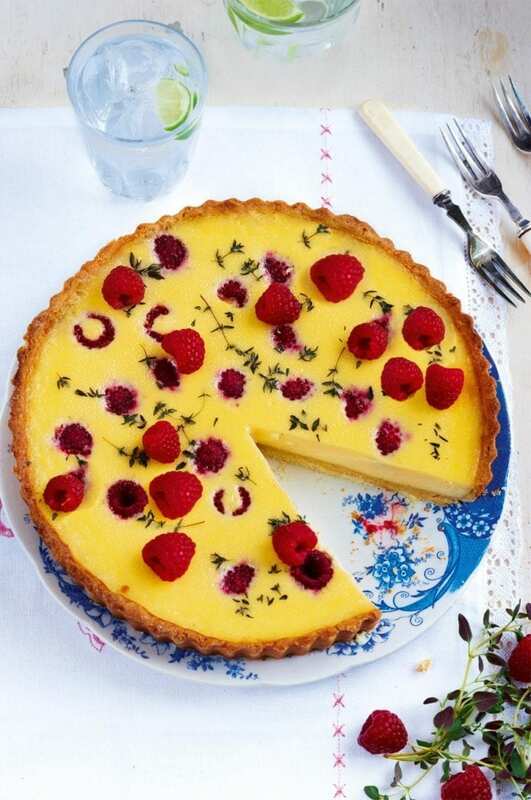 Strain the custard into the pastry case and sprinkle over the raspberries and the remaining thyme sprigs, leaves stripped or broken into pieces. Bake for 25-30 minutes until lightly set. Leave to cool slightly, then remove from the tin. Serve warm or at room temperature, garnished with a few extra raspberries. To freeze: place the uncooked ball of pastry, wrapped in cling film, then foil, in the freezer for up to 3 months. Defrost fully, then continue. I have made this many times. It is very summery and each time I have made it, it has been enjoyed by all. Lovely tart. I love this recipe because it combines my two favourites raspberries and custard. Made for sharing? Not! I love this recipe because I always forgot about using thyme in desserts! And it works so well. Plus it’s unusual and makes everyone think twice about the flavours!